The books and pamphlets listed here are publications of the Wymondham Heritage Society and are for sale in the museum shop. We also stock books on related topics by other publishers. The books and pamphlets shown here may be ordered by post [see details at the foot of the page] or bought from local booksellers. For nearly 700 years the Wymondham Market Cross has been both a memorial of Christianity and a gathering place for secular business. It is linked as firmly in people's minds with Wymondham as the Abbey and is remembered as clearly by visitors long after other memories of the town have faded. 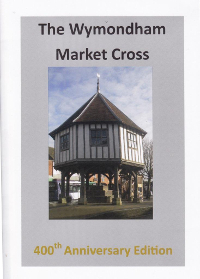 This new booklet commemorating the 400th Anniversary of the building of the new Market Cross following the major fire of 1615, is part speculation, part an attempt to piece together some fragments of information about the origins of market crosses generally and the Wymondham Market Cross in particular. 16 page A5 booklet on quality paper with 19 Illustrations, 10 in colour. The Wymondham to Attleborough section of the Great Road between Norwich and London was a wide marshy quagmire. In 1696 a plan was begun to improve it. 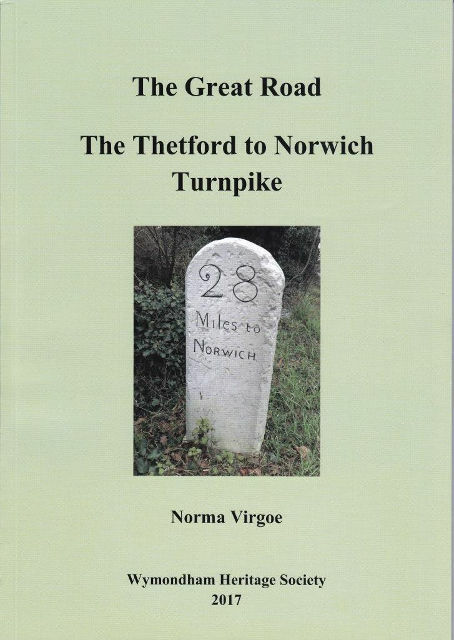 The latest book from the Heritage Society is by well-known author Norma Virgoe. A4. 78 pages with 52 maps and illustrations. The late John Wilson was the acknowledged authority on the Wymondham Fire of 1615, having studied the subject for several decades. His illness prevented him from completing the book, which was finished by Adrian Hoare, another local historian and author. This book, which is available in town bookshops, tells the story of the fire, who caused it, its consequences for the town and how fire fighting developed over the succeeding decades. The author is a local historian who has studied Kett, one of Norfolk's greatest heroes, for many years. This book seeks to show how a disorganised protest was transformed by the outstanding leadership of Kett, a successful yeoman farmer and tanner of Wymondham. This new history of an old and historic town is the result of research by a team of experienced local historians. It presents the major developments and events which have shaped the town from earliest times to the present It will be appreciated by residents and visitors as an extensive and readable introduction to Wymondham's history. For centuries inns and taverns have played their part in Wymondham's commercial, social and public affairs. Philip Yaxley, a local historian of long standing, provides a fascinating study of the changing fortunes of the town's inns and hostelries from the sixteenth to the twentieth centuries. The Market Cross is linked as firmly in people's minds with Wymondham as the Abbey. It has been a symbol of the town's pride and a gathering place for all kinds of business since it replaced an earlier cross burned down in the great fire of 1615. This pamphlet explains the importance of market crosses and the history of this cross from the early 17th century to the present day. Wymondham is an old and historic market town with much of interest to offer both residents and visitors. This pamphlet provides an informative guided tour round Wymondham's central streets, drawing attention to the principal features of its built environment and their history. These include the Abbey, Becket's Chapel, the Market Cross, the Bridewell and many interesting houses dating back to the post-fire rebuilding after 1615 and in some cases to the 15th century. This pamphlet explains Robert Kett's background, the local standing of his family and the beginning of the Norfolk Rising. The reader can follow a plan of a trail round the central area of Wymondham revealing what it was like in Kett's day and his links with it. A drive round local places of interest connected with Kett is also provided. This pamphlet describes the physical setting of Wymondham and its underlying geology of chalk upon which boulder clay was deposited during the Ice Age. The different types of rock brought into Wymondham are examined and where these may be found in local buildings. Maps showing local relief and geology are included together with a geological cross-section. The story of Wymondham Bridewell is told from the time of John Howard's visit in 1779 to the establishment of the Heritage Museum in the 1990s. Extracts from contemporary documents help to characterise the model prison which had its new cell blocks by 1785 and was complete in its present external form by 1810. Its later uses as a female penitentiary and then as a police station and magistrates' court are carefully explained. This booklet is an account of the founding of the first volunteer fire brigade in the town, of men who served in it and their activities. The creation of the brigade was a major event and was regarded as an important element in the life of the town. This study of how they went about their work gives an insight into various aspects of late Victorian and Edwardian life in Wymondham. This book traces the history of Wymondham Grammar School from its foundation in 1561 to its closure in 1903. It follows the ups and downs of its success and popularity, and the many ways it coped with the recurring problem of lack of funds. This new study shows how the life of the school was affected by the religious and political thinking of the day, as well as by the wide variety of headmasters who served it.